Originally, I intended this post as a do-it-yourself guide on how to add alerts to MetaTrader indicators without knowing how to code at all. But writing it, I came to realization that even if a trader knows nothing about MQL language and coding he will have to learn some basics through this guide because adding alerts does require deep understanding of how MetaTrader code works. Add input parameters for turning alerts on/off and adjusting some alert settings — all entirely optional but it is better to have some easy way of configuring things than to re-code everything each time your needs shift. Identify indicator buffers that are used by an indicator and contain the data you want to be alerted about. Formulate conditions for alerts to fire up. For example, a classic condition for MACD buy alert could be formulated as: current MACD Signal below current MACD Main and previous MACD Signal above previous MACD Main and both current MACD Signal and MACD Main are below zero. Conditions can be simpler or more complex, but you should already know what you want to be alerted about if you are looking to add alerts to an indicator. You will need access the indicator’s source code — .mq4 file for MetaTrader 4 and .mq5 file for MetaTrader 5. Sometimes indicators use more than one file for their source code. In such case, you would need .mqh files as well. You will not be able to add alerts to an indicator if you lack its source code. You can ask the indicator’s author for the source code if you only have a compiled file (.ex4 or .ex5). Although you do not need to have prior coding experience to follow this tutorial, you still need to have some understanding of coding basics, for example: how to compile an indicator or what a variable is. You need to pay attention to every step listed in this tutorial. Thoughtless copy/paste will not work here at all. Most of the time, traders want the plain native alerts but it is a good practice to implement all four at once and to give a choice (via input parameters) to enable and disable certain types of alert. You will learn to add four input parameters: EnableNativeAlerts, EnableSoundAlerts, EnableEmailAlerts, EnablePushAlerts. Another important input parameter is the candle to use for triggering the alert. Normally, you want the alert to be triggered on the close of the candle #1 when the latest candle (#0) has just started forming — that way you get a final and true alert (unless your indicator repaints itself). Sometimes, traders want to receive their alerts as fast as possible, then looking for alert conditions on candle #0 can be a better choice. Of course, the alert may turn out to be false as the indicator values on candle #0 a susceptible to changes with each new tick. The input parameter that controls the number of trigger candle will be called TriggerCandle. It will be equal to 1 by default, but a trader will be able to change it to 0. If you plan using email alerts, adding an input parameter for an email subject is also a must. EmailAlertSubject can be set to some fixed string or it can be modified by the alert code during run time. The former case is much simpler of course. Do not forget to enable and configure email alerts in your platform via menu Tools->Options->Email. If you plan using push notifications to your phone or other mobile device, you need to enable and configure them in your platform via menu Tools->Options->Notifications. All types of alerts need some text to display or send. AlertText parameter can contain some preset text, which will also be modified according to the particular alert’s parameters. One additional parameter is useful when using sound alerts — SoundAlertFile. It can be used to set the name of the audio file for the platform to play during alert. This code uses empty initial alert text and email subject. They will be filled during alert evaluation. Where N is the buffer’s number (you do not need it for alerts) and Buffer_Name is the buffer’s name, which you need to formulate the alert conditions. Now, the tricky part is to find the right buffers if there are more than one. In MT5 and newer MT4 indicators, you will see this INDICATOR_* parameter in SetIndexBuffer call, which can help determining the right buffers for alert – you will want those with INDICATOR_DATA (they produce the actual display on the chart). In some cases, determining the right buffer is easy – there might be only one, or it is called appropriately, or you know how the indicator works. In other cases, I would recommend some trial and error work if you do not want to study the code. Looking at some real life examples of SetIndexBuffer calls might help you finding the buffer names in the indicators you work on. Obviously, ExtMacdBuffer is the main line buffer and ExtSignalBuffer is the signal line buffer. Naturally, you would think that dUpCCIBuffer is for Up-arrows and dDownCCIBuffer is for Down-arrows. But what is dSellBuffer? The thing is that if you search the code for it, you will find that it is not used anywhere at all. It means that you can safely ignore it and base all your alerts on the former two buffers. 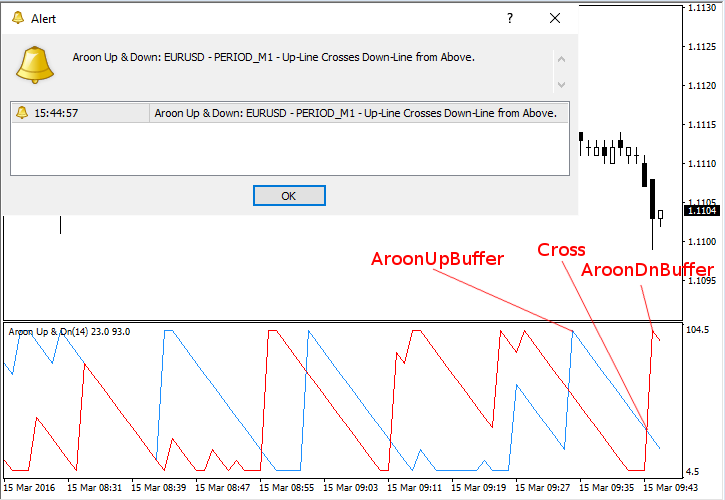 Both SetIndexBuffer function calls have INDICATOR_DATA parameters, which means that both buffers (AroonUpBuffer and AroonDnBuffer) contain values plotted on the chart. Clearly, AroonUpBuffer is used for calculation of the Up-line and AroonDnBuffer is used for the Down-line. The INDICATOR_CALCULATIONS parameter tells us that ROCSum is not an indicator buffer used for display but rather a buffer used for intermediate calculations. Coppock is the only buffer that can be used for alerts here – unsurprisingly so because Coppock indicator is represented by a single histogram. Now after you have successfully identified the names of the indicator buffers that you plan using in your alerts, it is time to add the actual alert conditions. All alerts are appended to the end of the indicator’s main calculation function. In older MetaTrader 4 indicators, it is called int start(). The alert conditions code should be inserted just above the last return(0); statement inside that function. In newer MT4 and in MT5 indicators, the function is called OnCalculate and its declaration can vary from one indicator to another. You have to insert the alert conditions code just above the last return(rates_total); statement inside that function. The actual conditions will differ depending on the alert type you wish to add to the given indicator. This guide will cover the three most popular cases: signal, level, and cross. The code should be added just before the latest return(0); statement inside the start() function. That code should be inserted just above the latest return(rates_total); statement inside the OnCalculate function. It assumes that the time and buffer arrays are not set as series. If they are, you would need to substitute TriggerCandle for rates_total - 1 - TriggerCandle and time for time[rates_total - 1]. As is the case with the previously discussed signal alert for MT5, you would need to substitute TriggerCandle for rates_total - 1 - TriggerCandle and time for time[rates_total - 1] if the indicator sets its buffers as series. Also, rates_total - 2 - TriggerCandle would have to be changed to TriggerCandle+ 1. Same as before, substitute TriggerCandle for rates_total — 1 — TriggerCandle and time for time[rates_total — 1] if the indicator uses buffers that are set as series. Again, rates_total — 2 — TriggerCandle would have to be changed to TriggerCandle+ 1 in that case too. Of course, the variety of alerts is not limited by the three types described above. Some alerts can have multiple dependencies (e.g. one line crossing the price while two other lines cross each other), other alerts might depend on time, volume, additional calculations, or a combination of various factors. It is even possible to add alerts to indicators that do not use buffers or plot anything on chart. Such cases are not covered by this DIY guide. Some basic cases can be easily derived from the code snippets offered above while difficult cases are nontrivial ones and demand special approach and extra attention. However, you will certainly learn to add such complex alerts after some practice with the elementary ones. Add the predefined input parameters just below the latest extern or input statement in the indicator’s source code. Identify the buffer names that represent the indicator’s plot on chart. Insert the appropriate alert conditions code just above the latest return(0); inside start() function or return(rates_total); inside OnCalculate function. Replace the buffer names with those that you identified in the second step. Update 2016-12-21: I have updated the code snippets with correct examples. Previous versions would produce unlimited number of alerts if TriggerCandle was set to 0 (alert on the most current candle). Update 2018-02-20: Listed the requirements for adding alerts to an indicator and provided instructions for adding push notification alerts to mobile devices. If you still have some general question about adding alerts to custom MetaTrader indicators or if you want to share your own tips for doing it, please use the commentary form below. If you want help with adding alerts to a specific indicator, please post about it in the forum. All requests for help posted via commentaries to this post will be ignored. Indicators with Alerts or Without Alerts? Muchas Gracias, lo entendi todo. i have one problem my indicator shows repaint…..
i am waiting u r reply. Sorry, but I don’t understand your request. Why would you want to add some extra code files to your repainting indicator? I’m trying to get an alert to my ADX, everytime DI+ and DI- hitting a value, say 20, I wish to get notified. However the alert is acting strangely it is reapeating the alert over and over again when it does cross the value, it would be realy awesome if you could explain to me what exactly I have to do to fix the problem. Could you please share your indicator source code file and post a link here? So I could look at the problem? You can share your whole code via http://pastebin.com/ or a similar website. I have also updated the post to prevent such problems with alerts for other users. Thank you for your fast response. I hope I set all the parameters correctly, your code is a lifesaver! I want to create MACD cross over alert what shoild I do..? Look at the AroonUpDown example and replace the AroonUpDown buffers with the MACD’s signal and main line buffers. Thank you very much for your comprehensive post regarding how to code alerts for MT4/MT5 custom indicators. Unfortunately, I am currently stuck trying to add an alert to a channel indicator. What I want to do is fairly straight-forward. The alert should be triggered by price on the current candle equaling a certain channel level (in some instances only when price approaches from above, in others only from below). I would be grateful, if you could give me advise on how to manipulate the code in order to create said alert. That did the trick! A great many thanks to you. Despite the risk of coming across as impertinent, could I ask you to give me an idea on how to add a function that pauses the alert for a certain time period (say five minutes, or until the current bar has finished) after it has been triggered? It will make it trigger only once on the current bar. Really, having at least some basic understanding of computer code seems to be indispensable. What I would like to know is, is it possible to add the option so you can select custom alert sounds instead of the default alert.wav? Yes, just replace alert.wav with the filename of your choice. so is it possible to add different alert sounds to different indicators? Yes, it is possible. PlaySound() functions takes a sound filename as an argument. Most indicators with alerts (and also the code examples in this post) use an input parameter for the sound filename, which is usually “alert.wav”. You can set a different sound file name for different indicators and have them alert you with different sounds. You would probably need a custom indicator coded for that. I have a channel indicator that works well, but I would like to add alerts to it when the candle enters the retracement zone of the channel. I understand your steps, but how do I access the code on the indicator so as to add the alerts? Hope you understand my question. If you there is the source code file for the indicator in your platform, it will open it. Otherwise, you have only an executable (.ex4) and you have to ask the author of the indicator for the source code file (.mq4). Also, in case you do not know, this indicator is repainting the arrows – it only draws them 3 bars into the future. E.g., if there is a turn in line, it waits 3 bars to confirm it and then draws an arrow like it appeared 3 bars ago. This also means that you will never get an alert for such an arrow if you set TriggerCandle to 1. If you want to get arrow alerts here, your TriggerCandle should be equal to SignalHP. Please do not submit such huge pieces of code in comments. Either upload your indicator somewhere and share a link or use pastebin. For PlaySound() to work with your custom .wav file, the file has to be located in /Sounds/ subfolder of your platform’s data folder. Andriy.. first of all thanks for sharing your knowledge! Would you mind to help me with it? I do not code on request. As far as I can see, that indicator already has alerts added. You can start a thread about it in our forum about MetaTrader indicators – perhaps, someone will be able to help you out there. Thanks for taking the time and patience to write this out. I’ve been trying to understand it for quite awhile. It takes someone like you to completely explain it and that’s not easy to find. I appreciate it. Thanks for the post, unfortunately I think I may have made an erro, as I cannot seem to get the script to work. I have pasted it at and would love if you could let me know where I have gone wrong. Apologies for the most likely silly error! It will not work if arrays are not set as series. If you want to use such arrays, then you have to modify the alert conditions accordingly. For example, the number of the latest bar is no longer 0, it is rates_total-1, and the number of the pre-last bar is no longer 1, it is rates_total-2. Great article. I would like to attach a file with this message. How do I do that? I keep getting errors. How do you add alerts for red or blue dot signals? #property description "Draws signals based on the cross of the stochastic above 80(blue) below 20(red) default"
#property description" K Period and D Period / Main Line & signal line." #property description "User can set the level the signal is drawn on the inputs tab." I don’t see any code here that would add alerts. Please use pastebin.com to share large pieces of code. Thanks for the article, it’s great! I would like to add a sound alert to the force index (mt5), but I’m having difficulty understanding step 3, alert conditions, where exactly to add it and how to change the code to get a sound alert when price crosses levels at 6000 and -6000, please could you help me? I tried to add the code you gave for levels into the force index code in the positions you advised with the intension of editing where nessecary to get the desired results but when i hit compile it brings up number of errors and warnings, errors are all ‘undeclared identifier’ and warnings are all ‘implicit conversion of ‘number’ to ‘string”. You need to make sure you follow the instructions provided in the tutorial. Unfortunately, I cannot read people’s minds. If you share your code via pastebin.com, I would be able to look at it and help you. What is that Coppock buffer you are trying to use in your alert conditions? You don’t need to embed anything here. Just copy and paste the link to the pastebin share you created. I copied the section of code in the tutorial and added the conditions to the force index indicator. I didn’t add or remove anything just applied the example code in the appropriate places. You need to follow the steps 2 and 3 of the tutorial. I have already replied to you with the buffer name you need to check, so you can skip step 2. Copying example code into a different indicator will not work. You taught me ‘how to fish’. Now I just created alert for two indicators with your instructions here and it’s working fine. Thank you very much for your great post. i have added successfully email and sound alert into indicator, but why it is not attached on chart.my mt4 version is 4 and build 1090. I have removed the indicator’s code as it looks like a decompiled one. I am not going to discuss decompiled code here. As for your question, check if there are any compilation errors in MetaEditor when you compile it. It looks like it did not compile. If it does compile without errors, check the Expert tab output in the platform when you try to attach the indicator to the chart. Appreciations for this great post. I just added alert for “stepma color” indicator. Everything works well except it gives alert on each new candle. Could you please guide me to correct the issue. Nice work! But you should have used the Level type of alert from the post instead of Signal. Your indicator’s buffer changes to Up or Down and stays there. Try changing the alert conditions so that they are similar to those in the Level alert example in my post. Thanks for your kind reply. I used only the first example CCI arrow signal alert code. Please see in the line no: 119 it is “// Up Arrow Alert”. In the CCI arrow example there is only one signal for trend change. But in my indicator signal dots displays on every candle and only changes color when trend change. I do not know how to get alert only at color change and to stop alert on next candle(trigger candle+2). As I have said, you need to use Level example, not Signal. oops, i misunderstood. Now i am clear on that point now, but still have doubts in logic. Coppock has separate window indicator and had used zero cross. Here, step ma is on-chart indicator and have no cross value except price. In the code there are only two buffers blue and red dots and not crossing anything. If you have spare time please clarify. It will be very useful for all on-chart color change trend indicators like HMA, Non-lag ma etc. You need to use the Coppock (Level) example because you want alerts on indicator’s level change – from no signal (-1.0 value) to some price level. The colors and chart/separate window don’t matter at all here. Just make sure that your alert condition checks that the current value is above zero (it already does that in your pastebin) AND that the previous value was below zero. Thank you very much. I successfully added alert. I think this page is very precious for non-programmers. It does not look like you tried to add the alerts here. Also, the second indicator is clearly a decompiled source code, which is against the MetaQuotes EULA, – I will not discuss adding alerts to the decompiled indicator. Have you tried following the tutorial provided in this post? Also linking to your indicator (via Pastebin for example) would be helpful. can you add in the code for the alert? thank you..
First, please do not post such big pieces of code as comments. Publish them via pastebin.com or similar websites. Second, it is a decompiled indicator. I do not discuss decompiled indicators as it is against the MetaTrader’s EULA to decompile the .ex4 files. You need to contact the author of the original indicator and ask him or her to add the alerts to the indicator. I got a custom indicator on the MQL5 Community and will like to add alarm to it. can that be possible? Probably, yes. Did you try following this tutorial? change, there are two buffers, i currently have to visually monitor entry points . So, you failed to identify the names of the buffers used in the indicator? You can recognize them by finding the calls to SetIndexBuffer() function and looking at the variables it refers to. i am pulling my few hairs out here.. can i send you the MQL4 Source File? You can upload it to pastebin.com and post the link here. The names of the indicator buffers are upBuffer and dnBuffer. and i must add code just above, man now i am cofused, please help.. Thank you for creating this post, this was the only really helpful article I found online on this subject. Keep it up. I added the alerts to a indicator. It works. Yeayy. That is 1 step to the right direction. However, I have 2 challenges with it. 1) It gives for one alert both arrow’s texts, making it confusing. 2) When I attach the same indicator to more charts at the same time, if one chart gives a alert, the app gives me alerts for all charts the indicator is attached to (with the same confusion as challenge 1). Can you share with me some pointers of how to fix it? As for your second issue, what do you mean by “the app”? There is no way, this indicator can give alerts based on data from the other charts. Unless there is some serious bug in MetaTrader 4 itself, which I highly doubt. I followed you instructions to add an alert to a pinbar indicator. Problem is, it keeps poping the alert even when the arrow has not appeared on the chart. Could you kindly help fix it and only give a pop up alert when the indicator makes an arrow in the chart? on line 20 and 21 after it gave me an error. Could you help me identify why its not poping an alert? Kindly help me resolve that as well. Looking forward to hearing from you. Remove return(0); on line 112. This line prevents anything below it from ever executing by telling the program to return from the current function. You can get rid of the warnings by removing the declaration of those variables. However, these warnings are harmless and will not affect the execution of your indicator. That probably means that you have done something wrong. It is difficult to say what without seeing the code. Hello, i’m new in this things, i use mt4 and an indicator for binary option. But i need to put an alert when the arrow appear on grafic. I’m from romania and also i don’t speak very good english so i dont’ know hot to write all the code. Need some help please. It should not be difficult to add the alerts to this indicator if you follow my tutorial. You can learn how to do it if you study the examples for the signal type alerts. can you tell me what it’s wrong here to try to change this? It does look like you’ve made it through these steps. You just copied the code from the example. I think that you would get better results if you were using the names of the indicator buffers that you have found instead of the names you copied from the example in the alert checking conditions code. Sorry, but you have to follow the whole tutorial rather than just copy and paste a piece of the example code. You can try following the tutorial. Actually, it is posted here to help you add the alerts. Hi guys, anyone knows how to code an alert in mq4 please..I need to have an alert for when there is a color change signalling a reversal. Please have a look at the pic attached. At point 1 we can see that as the candle reversed into an uptrend there was a color change in the 2FMA’s (from red to blue and at the same time from pink to cyan colour)..the change occured SIMULTANEOUSLY, THAT IS CYAN AND BLUE COLORS APPEARED SIMULTANEOUSLY ON BOTH FMA’S. In point 2 you can see that the opposite happened (PINK COLOUR APPEARED FIRST BEFORE THE RED). I need an alert for ONLY WHEN THE COLORS APPEAR SIMULTANEOUSLY, ONLY SIMULTANEOUSLY (CYAN AND BLUE SIMULTANEOUSLY AND PINK AND RED SIMULTANEOUSLY). I need urgent assistance. I tried the alert indicator but I am getting errors as I tried to compile. Sorry, your pastebin page is not opening. Here is the coding in term of my last comment. Id be appreciative if i can get the correct coding, that is, WHEN THE CYAN (AQUA) CHANGES COLOR EXACTLY AT THE SAME TIME AS THE BLUE COLOR IN AN UPWARD AND THE FUCHSIA (MAGENTA) COLOR CHANGES COLOR EXACTLY AT THE SAME TIME AS THE RED COLOR IN A DOWNWARD TREND. These are 2 moving averages (one with cyan and aqua color and the second with blue and red colors). Yanga, please do not insert large pieces of code into comments. You can use pastebin.com to share the source code and imgur.com to share images. However, your code is a decompiled indicator. I will not help with any modifications to decompiled indicators and will not allow discussing decompiled code here. Please contact the author of the original indicator and ask him or her to modify it. You should not compare TriggerCandle to ’50’. You only need to compare the indicator’s buffer with the alert level. TriggerCandle is number of the candle, which should be checked for the alert condition. Usually, it is either 0 or 1. Also, your code is checking RSI values, not RSIoMA – not sure if that is what you want to achieve. hello, i tried yout method of adding alert to this indicator but it stopped working the moment i add the alert code, i mean it does not display again untill i removed the alert code. The name is Beginner indicator. It does not look like anyone have tried adding any alerts to this indicator. PS: By the way, there is little point in adding alerts to Beginner as the indicator repaints itself. That means that the alerts would be useless because they would appear either too late (alerting about the dots which the indicator draws in the past – beyond the period of repainting), or on the dots that would soon disappear as the indicator repaints them. Just launch the Beginner indicator in the Strategy Tester fast forward to see what I mean. Thanks a lot. This post is very helpful. After reading your great article on adding alerts on MT4 and MT5 indicators, i tried a few for myself successfully ie ADX and Stochastic which are my favorite indicators, however i am still learning without success how to combiine these two indicators into one. What brings me here today is this https://pastebin.com/bj5H5LiC a free stochastic x8 indicator i got from MQL5 community and added two alert conditions to it, however my intention is to have one alert when all the lines are above the 80 level and on a different alert when all the lines are below the 20 level. as of now it seems to send an alert for every different line which is not how i need it to work. i have identified: Ind[numb].IndBuffer as this indicators buffer but that didnt work until i substituted “[numb] for . 1. There are several lines check (the default number is 5 and it is defined using LINES_TOTAL macro). So a simple condition would not work. You have to cycle through all 5 lines each time and check whether all are above 80 or all are below 20. This means that to access the latest bar you write Ind[numb].IndBuffer instead of Ind[numb].IndBuffer[rates_totale - 1]. This condition is needed to avoid alert popping up each tick when working with the latest bar – LastAlertDirection remembers the previous alert direction (-1 for “below 20” alert) and checks all further alerts if they are of the same direction. I have added code commentaries to explain the cycles. Indicator works well especially on higher time frame. I was so happy to find your article…I read it carefully and tried to add the alerts several time(adding input parameters, identify indicator buffers, set alert conditions) but did not get to work them. The other problem, after modified the original mq4 file, it could not be added to the chart. Dear Andriy…this indicator (Symphonie SentimentEmotion Combi Indikator v1.0) is my most favorite one. Please help me and add the alerts, specially the E-MAIL ALERT by changing the colors. I do not get ahead of that. I don’t quite get it. There is currently a normal popup alert coded in this indicator. Do you want email alert to trigger at the same time as the current popup alert? Or do you want it under different conditions? Dear Andriy. As you see the indi produce three different colors. I’d like to have an e-mail alert only in case the color becomes BLUE or RED. (the color yellow is uninteresting). I’ll try to use is it incl. your instructions. I understand your explanation but according to my indicator I want the alert only once after the condition meet. I use 3 exponential moving Average and the parabolic SAR all in mq5. Please can you help me how to deal with this. By “only once” you mean that the alert is triggered only once in the indicator’s lifetime (after you attach it and before you detach or close the platform)? Or once for each instance of conditions met (e.g. 3 EMAs cross – alert; after a few bars, the EMAs cross again – new alert)? If you are talking about the latter, then the tutorial explains just that case. If you check and update LastAlertTime variable, the indicator will not issue more than one alert per bar. #property copyright "Copyright © 2012, Marketcalls "
Before you add alerts to an indicator, you should first fix the errors, which prevent its compilation. You can help me put the alert on the gauge, I’m doing as in the tutorial but it’s not working. The code seems to have gotten corrupted when you inserted it in a comment. Please share it via pastebin.com or some file-sharing website. By the way, why don’t you ask the indicator’s author – perhaps, he already has a version with the alerts. I already sent a message to the creator he told me that incador counted the number of candles followed and he sent me saying that he could change to count alternating candles and he does not support. OK. Now I see the problem. In your alert condition, you have to compare BuyBuffer[rates_total - 1 - TriggerCandle] against Account, not just BuyBuffer. The latter is just the name of the buffer, whereas the former is the particular value in that buffer (the last finished candle if TriggerCandle is set to 1). I did as you said and the alert does not work, you can look at what’s wrong please. No idea, you can try asking in the forums. Great Post. I Followed the instructions and created some signal alerts for my Arrow Chart. However they keep repeating and when i open a new chart both signals show on the chart. Can you help me adjust it to where the alert only happens when one arrow shows on the chart. No, but you can post your question in the indicators forum. Please can you help add an arrow pop up alert to Bears and Bulls MT4 indicator? It’ll apply to close of candle to avoid repainting. The arrow and alert show up only for the bear indicator when and only if the histogram crosses from positive to negative value and also show up only for the bear indicator when and only if the histogram crosses from negativeto positive value. Copy and pasting wnon’t work. You will have to follow the tutorial. You should follow the tutorial to make that work correctly. If you need help, you should ask at the for it in the forum. Hi, thankyou very much for taking the time to share this. : ) Its great to be able to add the push notifications! Please help me in provide a code for the following specification. If i have 3 EMA’s. for example; fast Ma- 2, medium MA – 4 and Slow MA-25. i want indicator to alert me with the signal in the chart. Do you have the code for the indicator that shows the three EMAs on the chart? If not, then this tutorial won’t help you. You have to code an indicator somehow first. Hello , I would like to thank you for putting out this vitally important information to help get the most out of our trading indicators. I was looking for this sort of info for a long time. Its not easy what you do..Im just glad i found you when I did. So, I have this indicator I tried applying the instructions for making it an alert indicator. It compiled but wouldn’t open in my charts. I try and get this notification “cannot open file ‘C:\Users\Brian\AppData\Roaming\MetaQuotes\Terminal\8395B50B21A2D108FA5AA50E09F37B3F\MQL4\indicators\ADXcrossesNon-repainting + Alert.ex4’ ” . So i put the mql code in paste bin for you to take a look and see if I did something wrong. I would really appreciate if I could get this working. Thank you so much for all your help. If it compiled without errors, then there is no problem with the code. Please make sure that the ex4 file is generated in the folder mentioned in the MT4 error and that MT4 process has privilege to read that file. You would have to code a custom indicator for that and not a trivial one too. would you tell me where to start codding trend line breakout alert on indicator? I already find the trend line break out alert on price, but not sure how to change that into alert on indicator. So, you have an indicator that alerts you when the price breaks a trendline? Then, changing it to use an indicator’s value instead of the price when checking alerts should be trivial. You just read the included indicator values in your own indicator and compare them with the trendline in place of the price. Please do not paste such huge pieces of code into comments. Use pastebin.com or similar resources to host the code. From what I’ve seen, you have correctly identified the buffer, but you’ve placed the alert checking code into the initialization function, which runs only once on indicator attachment. The alert checking routines should be in the start() function. Also, it seems like the indicator already had alerts implemented in the first place. Hi Andriy, thank you so much for helping so many people understanding how to code, is really difficult to find someone like you, once again Thank you! If it’s not to much trouble, I would like to ask you how can I add a pop up alert with sound in my arrow indicator, he only has an an option to change sound on or off and I tried to follow your tutorial but I don’t have enough knowledge to do it. Sorry, but that’s a decompiled indicator. I do not provide help with decompiled code. I wanted to add push alert to that indicator. I couldn’t do it. And also when indicator is opened in M1 time frames, it repeats itself with the each candle close. For example, if the RSI is over 7- and as long as it stays over 70 in M1 timeframe, it repeats it with every candle close. It looks like you need to add Level type of alerts, but you are adding a Signal type of alerts. You can look up the Level example in the post. You should code a custom indicator that would check those conditions and issue alerts.